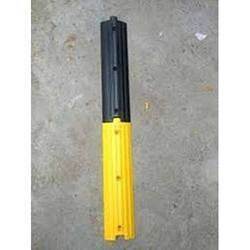 Leading Manufacturer of kohinoor plastic speed breakers ke-95, readymade speed breakers, kohinoor rumble strip ke-99, abs rumble strip, road rumbler and speed hump from New Delhi. 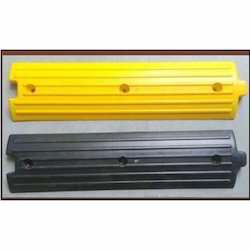 We have marked a distinct and dynamic position in the market by providing a high quality Plastic Speed Breakers. Our offered speed breakers are highly demanded in the market for their various quality attributes. Used to slow down the motor vehicles in order to reduce accidents, these speed breakers are designed by our adroit professionals using optimum quality raw material and progressive technology. Moreover, these speed breakers are rigorously checked under the guidance of quality controllers against various quality parameters. Available in Black & Yellow combination for Greater visibility. 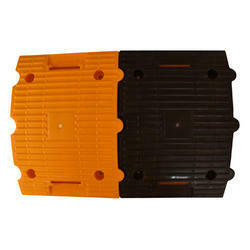 Interlocking between each module for more Strength and durability fitted with Reflectors. Instant and easy installation with the help of Epoxy and specially manufactured Galvanised Iron Nails. We are the leading Manufacturers of Readymade Speed Breakers. We use premium quality raw materials for all our products. We can customize the shape, size and colour as per the customer requirement. 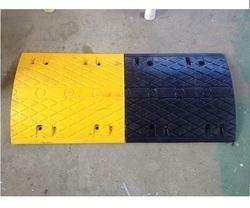 These are also know as speed bump, speed hump, speed reducers, speed breakers etc. Rumble Strip is made out of strong ABS Material. It is UV stabalized. It has to be fitted with nails and epoxy. Fostered with a team of highly experienced professionals, we are able to manufacture, wholesale and supply flawless quality ABS Rumble Strip. The offered strip is manufactured using supreme quality raw material and innovative technology by our adroit professionals. 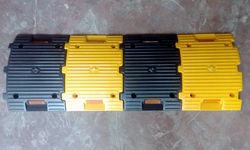 Our provided strip is made of sections in yellow & black colour combination to locate easily in the day time. Apart from this, we offer this strip to our clients at market leading prices. High resistance to sever impacts & harsh weather condition. Inter locking grip design 3 holes are provided for ground fitting. Standard Packing 20 Meters Retail Packing 10 Meters Minimum Order Qty. We manufacture premium quality Speed Hump that are available in various customized sizes. 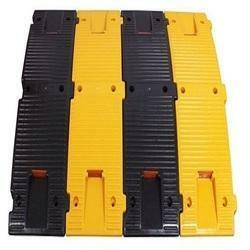 These rubber speed breakers are widely used in parking lots, malls, highways, industrial complexes, factories etc. Our speed breakers are easy to install and available in various sizes that exactly suits the client's and industry's requirements. We also customize these breakers as per client's specifications. We are the leading Manufacturers of Speed Breakers. We use premium quality raw materials for all our products. We can customize the shape, size and colour as per the customer requirement. The standard black and yellow colour speed breaker are available ex stock at the most reasonable price. 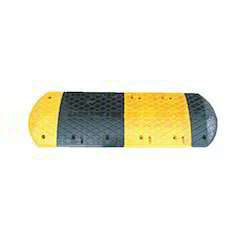 We have an excellent range of ABS Speed Bumps that we have been offering to our customers. These are developed using best quality raw material. Our speed Bumps can withstand heavy loads and severe climatic conditions. These are available in various sizes. With the support of our experts and sophisticated in-house facilities, we have been able to provide an optimum quality Plastic Speed Breakers. Our provided breakers are precisely designed using superior quality raw material and progressive technology. Additionally, these breakers are stringently examined by our quality examiners on varied quality parameters. Interlocking between each module for more strength, offered breakers are available in variegated technical specifications and sizes for our clients. Visibility modular design suits any road size. Black & Yellow combination for Greater visibility. Colours, which make it retain its colour for a longer duration. Epoxy and specially manufactured Galvanised Iron Nails. 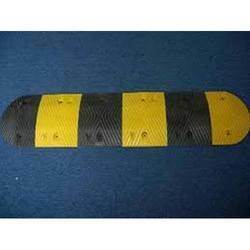 We manufacture and export Rubber Speed Bumps that are available in various customized sizes. 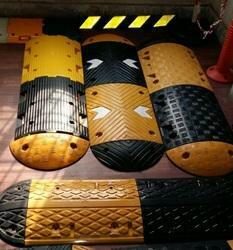 These rubber speed breakers are widely used in parking lots, malls, highways, industrial complexes, factories etc. Our speed breakers are easy to install and available in various sizes that exactly suits the client's and industry's requirements. We also customize these breakers as per client's specifications. With our in-depth knowledge and experience, we are engaged in manufacturing, wholesaling and supplying a superior range of Rubber Speed Breaker. Our provided speed breaker is designed by our skilled professionals using the latest technology and quality proven raw material. We provide speed breaker with reflectors and glass metals to make it suitable for night vision. In addition to this, our offered speed breaker is highly praised in the market for its compact design, optimum performance and smooth finish.